Written by owl and bear staff on Thursday, June 18th, 2015 at 9:00am. If an earworm could wear sunglasses and a leather jacket, it would be a Flaggs song. No San Diego act writes tunes as catchy as Flaggs, and certainly not with as much palpable fun and punk-rock charm. Whether it’s on last year’s “Got You Down” video or last month’s “Demon in His Way,” the “Motown grunge” band knows how to craft edgy, guitar-centric songs that get your toes tapping. The new single “Take a Ride” is no exception. The song is the title track on Flaggs’ just-released EP, which you can download here. Inspired by ’80s after-school specials, the video for “Take a Ride” finds the band walking to school together one morning. 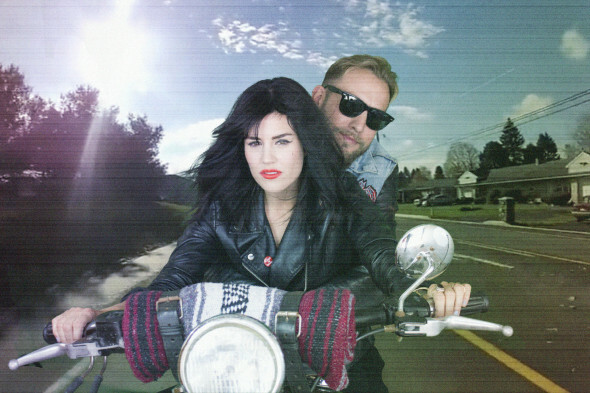 But when a motorcycle-riding bad boy (Low Volts‘ Tim Lowman) offers singer/guitarist Lindsay Lee a ride, she can’t resist taking him up on the offer. “Take a Ride” was directed by Owl and Bear’s own Chris Maroulakos, who previously helmed “Soft as Lions” for Soft Lions and edited Flaggs’ “Got You Down” video. It was shot on the mean streets of La Mesa, California. Video Premiere: Soft Lions - "Soft as Lions"